Rafa is different to a lot of managers – not only becasue he’s outstanding – but when he answers questions during his press conferences he thinks before he replies, and then gives an honest answer. And Rafa is always positive and upbeat, and we’ve seen that in many successful people over the years. In fact, he’s an excellent example of the things a great leader needs to have. Confidence, skill, and not least of all a strong mentality. 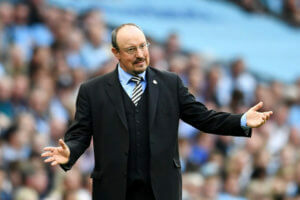 Several managers would have caved under the pressure after no wins after 10 games – but Rafa kept his gentlemanly manner throughout that period. Watching his press conferences this season, you would have never thought we were n any kind of trouble. Most things are in good shape on the training ground where Rafa has often said he really enjoys his day-to-day job at Newcastle. “In terms of the atmosphere at the training ground – it is really good. “The players train very well and in general we don’t have any big issues. “Outside there is a little bit of noise but we are focused. “We try to do our jobs as professionals. Hopefully, we can follow up our first win last Saturday against Watford with our second win against Bournemouth this Saturday at home. And we also hope we can have a sell-out crowd to cheer the lads on. Next Post Was 1898-1899 Season A Better Start Than This One? c-dog, b1tching and moaning for his entire life…. Listen, there’s a group of ladies of a certain age meet at the Cullercoats Crescent Club every month. They’re having a Xmas meal at the Briardene. I could probably get you in for a good old natter. You never know, by the end of the second Lambrini you might find someone to swap knitting patterns with. any of them worth a jump ? Jib, lol – rather you than me, that’s all I can say….